A man attempting to retrieve his large and possibly malicious parrot nearly drowned in mud Sunday afternoon, creating what Belleville Fire Department described as an "unusual and dangerous situation." According to a Facebook post by the fire department, "The gentleman went into the area to rescue his parrot who had inadvertently flown into the mud." Sure. A likely story. The parrot just happened to fly over to one of the dredged lakes at Bicentennial Park .... where Belleville Fire Department chief Tom Pour would have you believe that this parrot — a species that possesses the intelligence of a toddler and lives to nearly a century — sat back and watched the hapless human wade toward his own doom. It's all a bit too convenient, wouldn't you say? Anyway. The parrot did somehow end up in the mud, and when his owner went in to retrieve him, it apparently sucked him in. 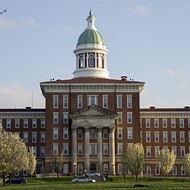 Eventually, a bystander heard the man's cries for help. Emergency responders got to the scene at around 4:30 p.m.
"He was probably several hundred feet out into the mud with the parrot on his back," Pour told the Belleville News-Democrat, which also captured video footage of part of the rescue. It reportedly took about fifteen minutes to pull the man out of the quicksand-like muck. 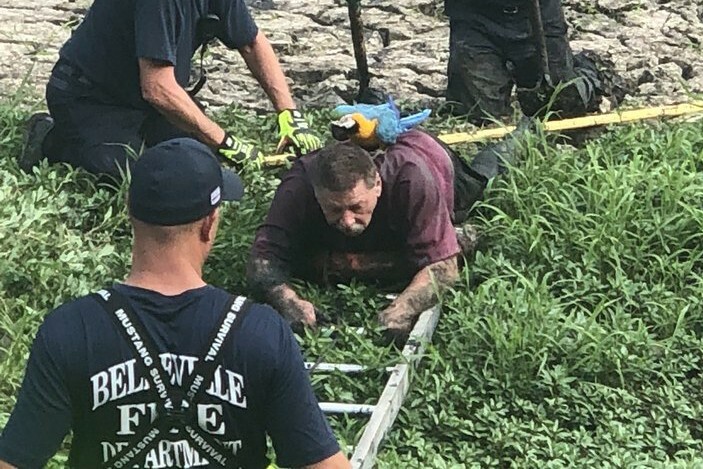 Photos show that the rescue featured multiple ladders, several firefighters and one extremely smug-looking parrot who by the way has freakin' wings and could have resolved this situation at any time. Look, seriously, we're not here to cast criminal aspersions on birds. This parrot — which appears to be a blue and yellow macaw — is probably totally nice, and the Belleville News-Democrat story even notes that the man frequently biked around the area with the parrot on his shoulder. That is a demonstrably cool and good thing to do with a parrot. And birds get startled and fly off all the time, right? Then again, isn't that exactly what a murdering parrot would want you to think? Is this the face of a not-murdering parrot? You be the judge.